Today, myself and a friend from work decided that it was about time we try home brewing for ourselves. We visited a local home brew shop, purchased a starter kit and bragged to all who would listen that our home brewed beer will be the finest in all the land. Will it be? Only time will tell. I just hope it won’t be anything like todays beer. 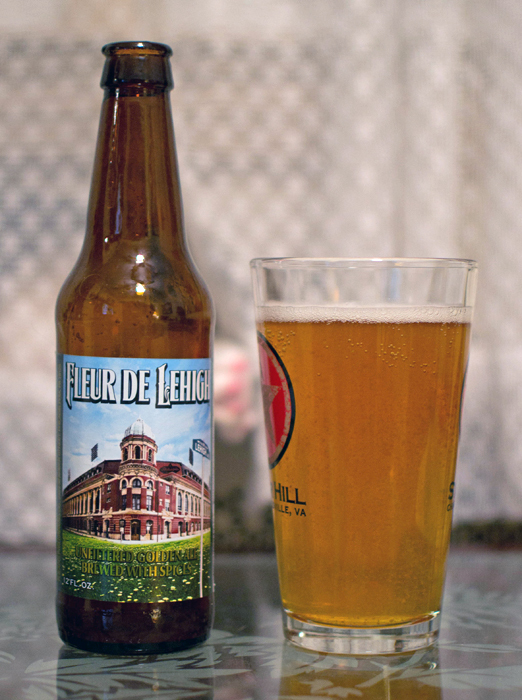 Beer #64 is Fleur De Lehigh by Philadelphia Brewing Company. A Belgian Pale Ale with an ABV 4.5%…sounded good but oh how things can go south in a hurry…or in this case a pour. My first indication something was wrong was in the pour. I could have sworn that there were quite a few chunky particles being released into the glass. Sure enough when I held it up to the light, swirling around were a bunch of chunks of I don’t know what. Some were the size of salt crystals, big salt crystals… similar to the sea salt you may find on a table at a restaurant. If you look close in the photo above, you can see the particles. The color was a murky gold color. The nose was absolutely horrible. The aromas were sour, acetic, vinegar…obviously a beer that has gone bad. I took a few sips, very unpleasant. This one went right down the drain. This was another first for me…I have never had a beer that has gone bad. I won’t give a rating since it would be unfair to rate a spoiled or bad beer. To keep the 365 going I had a brew by Magic Hat, Blind Faith. It was getting late so I will give my opinions of that one (I have another in the fridge) later in the week. Welcome to Norway! Norway, home of trolls and Nogne O. Nogne O , from the bottle, means “naked island”. I like most anything naked..who doesn’t? 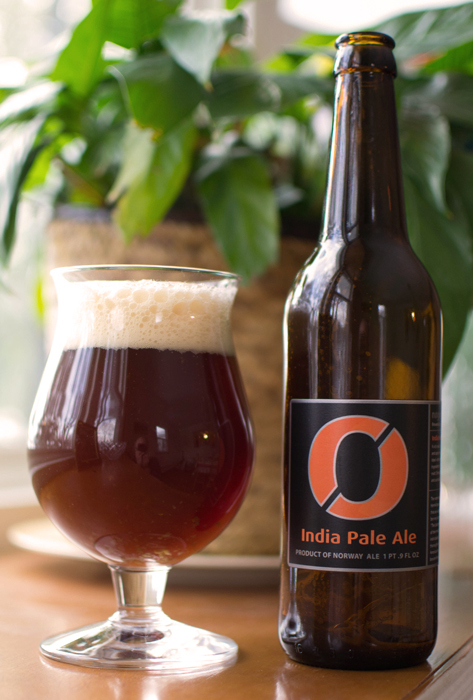 Beer #63 is India Pale Ale by Nogne O. I think it is obvious what style of beer this is, an American IPA. 60 IBUs and an ABV of 7.5% should make this a nice IPA offering. This was a very nice beer in appearance, deep dark amber color with a generous fluffy head. I dare you to take a sniff and not pick up those huge aromas of grapefruit juice. There was also a malty aroma buried in the nose. It smelled quite different from the other IPAs I have tried. The taste was slightly sweet with grapefruit juice, lots of malt and some pine. It had a nice slightly bitter finish to it. Mouthfeel was excellent. It had a slightly thick body with lots of carbonation. This was quite easy to drink. I thought this was delicious. Not quite as bitter as some IPAs and a tad bit sweeter make this a very unique IPA. I would give it a try if you have the opportunity. Short and sweet today as I am at a dinner party. 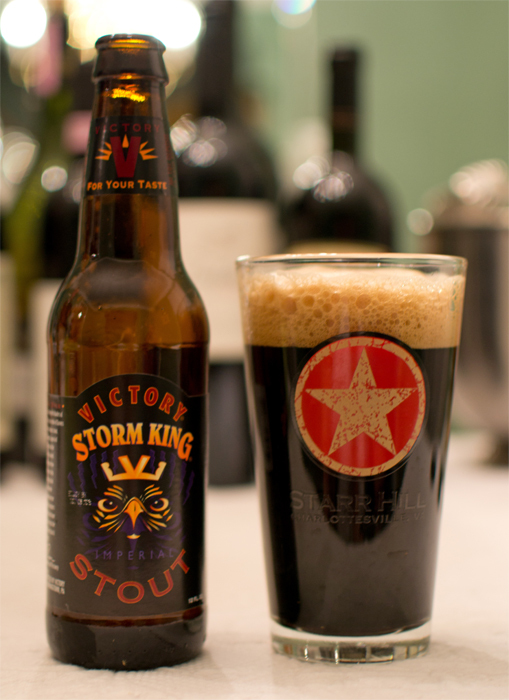 Beer #62 is Storm King Stout brewed by Victory Brewing Company. Storm King is a Russian Imperial Stout with an ABV of 9.1%. It poured a beautiful black color with a nice two finger width tan head. Nose was dark roasted malts, alcohol & cocoa. Tasted just like it smelled. Mouthfeel was a bit on the thick side with some nice carbonation. With such a high alcohol content, it will knock you for a loop if you don’t take your time with this. I enjoyed this very much. A very nice Russian Imperial Stout indeed. Back to dinner party I go, head swimming with alcohol, wittier than ever. Cheers!!! A few notes before I get into todays beer, some math. I have purchased 69 beers and have had 1 given to me as a gift for a total of 70. I have tasted, including this one, 61, with 9 in reserve for the days ahead. Total cost for the 70 beers, $328.82. That is an average of $4.77 a beer. 70 days of beer is just about 20% (19.17% to be exact) of the year. Take that $328.82 and multiply by 5 and it will cost roughly $1644 for 365 beers. The most expensive beer was $13.49 and the cheapest was $1.66. On a side note, I was 159 lbs. when I started 60 beers ago. Today I weighed in at 162. 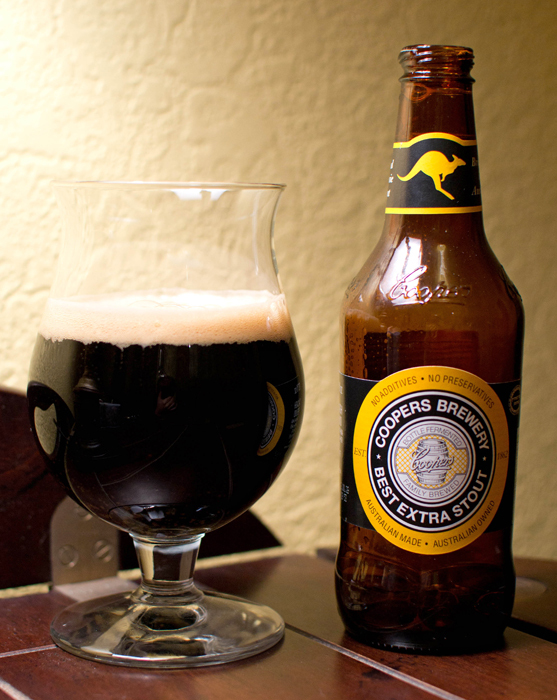 Beer #61 is Best Extra Stout by Coopers Brewery Limited. Coopers is from Australia. Best Extra Stout is a Foreign/Export Stout with an ABV of 6.30%. This is my first beer from the Australia…no I have never had a Fosters. Coopers version of a stout poured black as night with a thin tan head. Aroma was everything I like in a stout, smoky roasted malts, coffee, and a faint whiff of alcohol. It tasted just liked it smelled, coffee and malts, maybe just a hint of chocolate. There was a good deal of carbonation and despite its appearance, it had a body on the light side. 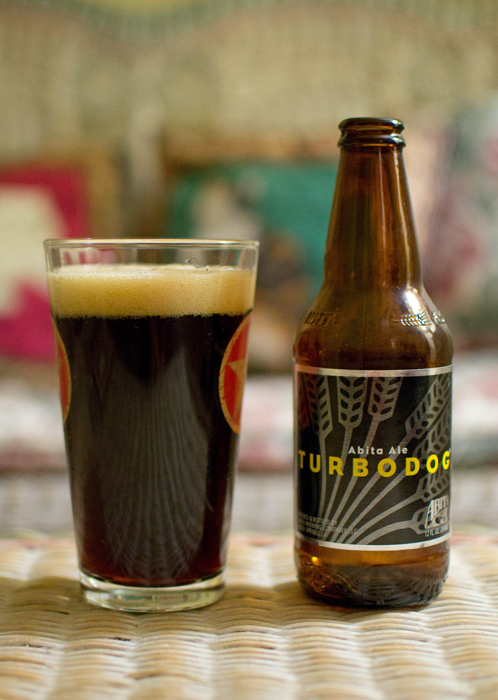 Most people think of stouts as being thick, thick like motor oil. That type of thinking is so far from the truth, at least with the stouts I have had, that I think it stops them from trying a stout. I admit I thought like that way back in the beginning of my beer drinking days drinking Coors Light. Drinkability was high with this beer. I could have easily enjoyed a few more of these. What we have here is a solid beer that I think most that enjoy stouts would like. Good showing from the Land Down Under. Now give me a Vegemite sandwich! Another winter week in NJ and another snowstorm. I woke up to more than 14″ of snow this morning. I have really had it with Old Man Winter, spring can’t get here soon enough. Beer #60, wow only 305 to go, is from Seattle, Washington. 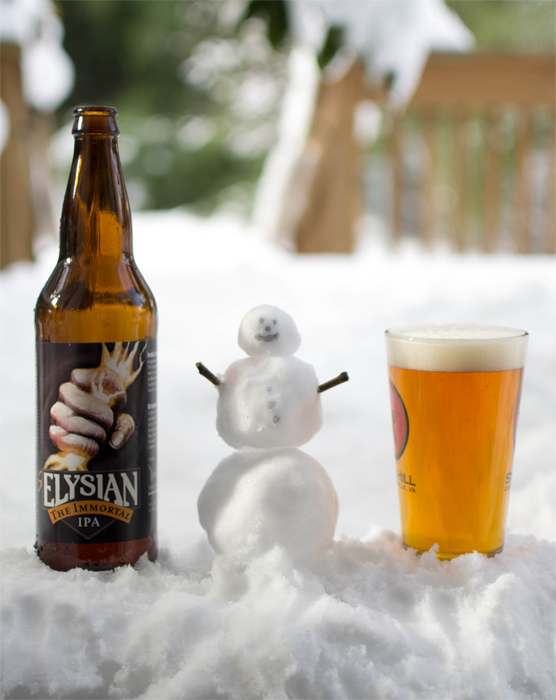 The Immortal IPA is brewed by Elysian Brewing Company in the style of an American IPA with an ABV of 6.3%. If you have followed this blog then you know hoppy IPA’s are some of my favorite styles of beer. The color of this brew, a clear golden orange, was beautiful. Very nice indeed was the head and it produced some excellent lacing on the glass. There was quite the action in the glass from all of those tiny little bubbles trying to escape the glass only to be captured by that head. My mouth was watering just looking at it. I dipped my nose in and was greeted by a slight hoppy citrus scent with some sweet malts. Taste was citrus up front with the sweet malts bringing up the rear. Mouthfeel was crisp with a medium body and a dry finish. It was pretty easy to drink this bomber. Overall it was a pretty good IPA. It wasn’t the best I have had though. To me 60 Minute IPA by Dogfish Head and Stone IPA by Stone Brewing Company are better examples of this style. 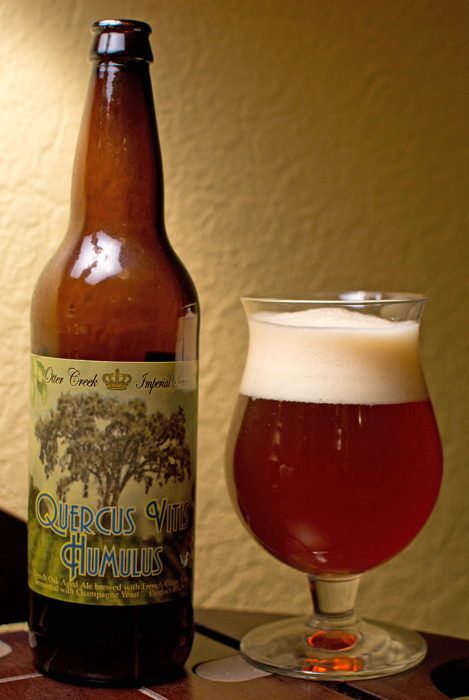 Beer #58 is Quercus Vitis Humulus by Otter Creek Brewing from Vermont. Say what? Quercus Vitis Humulus is latin and literally means oak, grape & hop. Sounded good to me! Brewed in the style of an American Strong Ale, this beer has an ABV of 12%. One interesting fact about this brew is that it was fermented a second time with Champagne yeast. It poured a orange amber color with nice size head. Grape juice was the most prevalent aroma along with a smell very much like what I experienced on a winery tour a few years ago from an oak aged wine. I picked up on some sweet malts also. Taste was a malty sweet grape juice (heavy on the grape juice) concoction with a bit of a bitter hop ending, at times reminding me of a highly carbonated wine. Mouthfeel was thick and syrupy with a ton of carbonation. Lots of alcohol make for a sipping drink. One bottle was enough for me. To me, this seemed like a beer that wanted to be a wine and at times a champagne. I thought there was way too much of that grape sweetness. I really didn’t like it all that much. It took me quite a while to finish it but finish it I did.